History is a unique Expert Lotto feature which provides 100% guarantee of finding the Jackpot winning ticket if several History parameters are correctly estimates. History is based on the latest occurrences of each winning number. Most of conventional lottery strategies analyze a fixed interval of past draws. However Expert Lotto History tracks fixed count of occurrences of each number no matter how long ago the number was drawn. By default History checks 11 latest occurrences of each number in the pool, however this count is adjustable in application preferences. The values in the second table row are called Level 0 in History terms. The values in the second table row are called Level 1 in History terms. The same applies to other previous occurrences of each number up to Level 10 as by default the History tracks 11 latest occurrences of each number. The table above shows Summary History values for the latest of the selected draws which is 2010/28 Sun 1st. 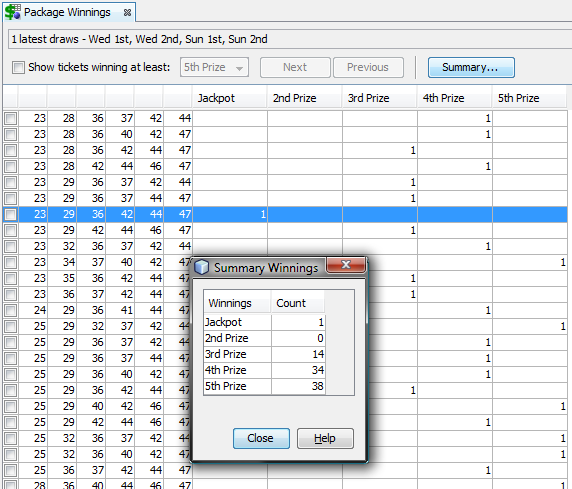 What happens after adding winning numbers from the next draw 2010/28 Sun 2nd to the Number History table above? Winning numbers for that draw are 23-29-36-42-44-47-. From the table above you can see that the value in Level 0 for all winning numbers is 1. Value in Level 1 is previous value in Level 0 + 1, value in Level 2 is previous value in Level 1 + 1, value in Level 3 is previous value from Level 2 + 1. Number History for all other pool numbers is simply the previous value incremented by 1. The table above shows Summary History values for the latest draw 2010/28 Sun 2nd. Click menu Package - Insert - Full Wheel to insert all possible combinations of 6 numbers from a pool of 49. There are 13,983,816 such tickets. Click menu Package - Reduce - Filter Tickets and choose Sums History filter. Click Select button in the filter window and select All draws except one latest draw to pretend that the numbers of the latest draw 2010/28 Sun 2nd haven't been drawn yet. Click OK button to apply the filter on tickets in the Package. Click menu Package - Show As - Winnings to check the winnings of tickets left after filtering. As you can see above, with History features you can reduce millions of number combinations down to a hundred or two hundred tickets while having 100% guarantee that the filtered tickets include the Jackpot winning one. However the problem is that it isn't easy to make correct estimates for all Levels. If a single Level value is out of the estimated range, the Jackpot ticket is lost. But here are various strategies to compensate for possible errors in estimated ranges. Level N - denotes the count of draws that elapsed since the N-th latest occurrence of a given drawn number in selected section of past winning numbers draws. Level 0 corresponds to the very latest occurrence, Level 1 corresponds to the second latest occurrence etc. There are 11 Levels in Expert Lotto by default so the History features operate with Levels 0 to 10. The count History Levels is adjustable in History settings. 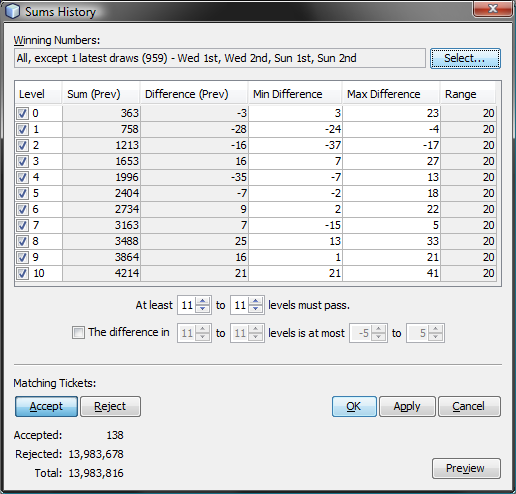 History Sum - sums up the count of draws elapsed since a given occurrence of all pool numbers, that means it's a sum of Number History values in a single Level column, see above. 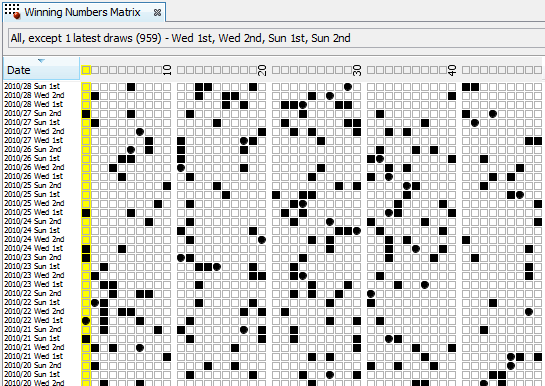 There are 11 sums for each draw. When filtering tickets in the Package for given History Sum values, there's always one ticket left and it is the Jackpot winning one. Difference - there are two kinds of History Differences: Number Difference and Sum Difference. Number Difference relates to a single pool number. It is the count of draws elapsed between two following hits of a given number. For example, if the latest hit of number 1 happened 5 draws ago (Level 0) and the second latest occurrence of number 1 happened 16 draws ago (Level 1) then the Number Difference in Level 1 for pool number 1 is 16-5=11. That means 11 draws elapsed between two latest hits of number 1. The Number Difference in Level 0 is the same as the Number History value, i.e. the count of draws elapsed since the very latest occurrence of a given number. Sum Difference relates to History Sum values. It is the difference between History Sum values in two consecutive draws. For example if History Sum value in Level 0 is 376 in the latest draw and the previous History Sum is 363 then the Sum Difference in Level 0 for the latest draw is 376-363=13. If History Sum value in Level 1 is 744 for the latest draw and the previous Sum in the same Level is 758 then the Sum Difference in Level 1 for the latest draw is 744-758=-14. Segment - consists of pool numbers whose Number Differences are in a given range. By default there are three Segments in Expert Lotto. The first Segment contains numbers with Number Differences ranging 1 to 6, the second Segment has numbers with Differences of 7 to 12 and the last Segment has numbers with Differences of 13 or higher. The segmentation of pool numbers varies for each History Levels. You can adjust the default segment settings in History settings. Segment Combination - shows the division of winning numbers from the following draw into the Segments for given draw in a given Level. For example segment combination 3-1-2 means that Segment 1 contains 3 of the winning numbers of the following draw, 1 winning number of the following draw is from the second segment and two winning numbers of the following draw belong to Segment 3. Estimates - when looking for the winning numbers you must guess how the History Sum values will change in the coming draw. Since it's extremely difficult to guess the exact History Sum value for the next draw we usually estimate a range the future History Sum value will be in. For example if the latest History Sum value is 376 in Level 0 then we might estimate the next draw will produce History Sum value in the range of 380 to 400. It means that our estimated Sum Difference range is +4 to +24. (Note this is just an example - the estimated range values are picked at random).